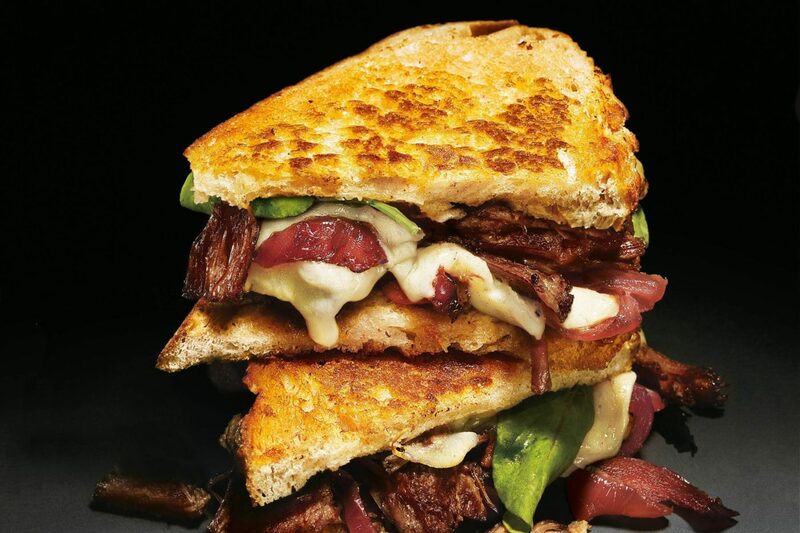 Delicious and hearty, this yummy steak sandwich recipe will hit the spot for any meal this autumn! In large self-sealing plastic bag, mix soy sauce, vinegar, sugar, thyme, and pepper. Add steak to marinade, Seal bag, pressing out excess air. Place bag on plate; let stand 15 minutes at room temperature or 1 hour in the refrigerator. Meanwhile, for easier handling, insert 1 long metal skewer horizontally through onion slices; set aside. Prepare grill or broiler direct grilling over medium heat. Remove steak from marinade; pour marinade into 1-quart saucepan. Heat marinade over high heat to boiling; boil 2 minutes. Place steak and onion slices on hot grill or broiler. Cook steak and onion 12 to 15 minutes or until onions are browned and tender and meat is medium-rare, brushing both with marinade occasionally and turning both over once. Transfer steak to cutting board.